Launching mid 2017, House of Jack has become an instant favourite of ours, offering a large selection of online casino games from a selection of the best gaming software developers. We take a look at the most popular, most frequently played online pokies at House of Jack and the bonus offers you can take advantage of to give these games a go. Thunderstuck II is an old classic from Microgaming, and given how visually outdated it has now become, you would think the subpar graphics would be a deterrent, but this game continues to be one of the most popular slots at all Microgaming casinos. 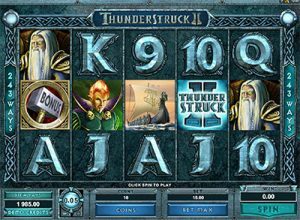 Thunderstruck II is a five-reel, 243 Ways to Win fantasy Norse god themed pokies game that is well loved for the large selection of bonus features it offers. Along with standard features like wild symbols and scatter symbols, Thunderstruck II includes such bonuses as the Wildstorm Feature, which can strike at random to turn up to five symbols into wilds. The Great Hall of Spins offers multiple free spins bonuses which sequentially unlock further bonus features, like the Odin bonus round which gives 20 free spins with an added Raven Feature, or the Thor bonus which awards 25 free spins with Microgaming’s trademarked Rolling Reels feature. Read our detailed Thunderstruck II review or get stuck into playing at House of Jack. This Quickspin title is wildly popular across the board at all leading online casinos, and with good reason. Not only does this game look incredible, it plays out flawlessly and keeps the player entertained during every spin, with several bonus features on offer. Based on the Three Little Pigs fairy tale, Quickspin uses crisp 3D animation to create cascading reels set against a countryside backdrop where the little pigs house of straw provides the frame for the reels. A beehive symbol is the games standard wild, but during every second winning spin all standard pig symbols can also turn into wilds. 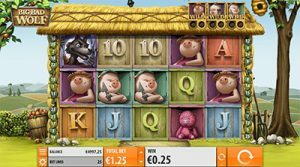 Get six winning spins in a row and all three pigs will turn wild (you can view your progress in the wild bar at the top of the screen). The wolf scatter symbol triggers a free spins bonus, but the real fun starts in the Blowing Down the House feature. Collect moon symbols on the fifth reel and you’ll help the wolf blow down the straw, wood and brick houses to claim further free spins and winning multipliers. This online pokies game by Play ‘n Go is truly a slot game of a different kind. 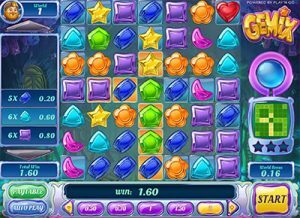 Based on a very similar format to the popular Candy Crush and Bejewelled Blitz games that took social media by storm, instead of using a standard three or five reel design, Gemix uses a seven by seven grid of gem symbols. As you line up different gem patterns and clear all winning patterns, you move up through different worlds, winning a World Bonus for each you successfully complete. Each world has its own unique wild symbol, with the wilds accounting for different wins in each world. There’s also a Crystal Charge meter to the side of the reels, which charges up during each win and is activated after winning on 20 symbols. The Crystal Charge activates such bonuses as the Nova Blast where one symbol explodes to transform adjacent symbols, and the Light Beam where one symbol shoots out light beams to hit and transform other symbols. Forget everything you know about pokies when playing Gemix, as this game really brings something new to the table. 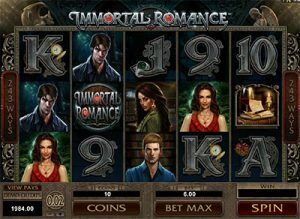 Very loosely based on the Twilight series of vampire romance books and movies, Immortal Romance is another Microgaming slot that’s been around for a few years now and shows no sign of decreasing in popularity anytime soon. It’s similar to Thunderstruck II in that it uses a five-reel, 243 Ways format with multiple bonus features, most of which are based around the Chamber of Spins bonus meter which expands every time three or more scatter symbols appear anywhere across the reels. Multiple entries into the Chamber of Spins will sequentially unlock further bonus features, like the Michael Bonus which awards 20 free spins with Rolling Reels and up to a 5X multiplier, or the Sarah Bonus which awards 25 free spins with Wild Vine feature which grows to turn additional symbols into wilds. While there’s really nothing vampire-ish about Immortal Romance, this is sure to appeal to those with a soft spot for the gothic romance genre, or anyone chasing games with plenty of bonus offerings. Read our detailed Immortal Romance review or start playing now at House of Jack. Once you take advantage of the welcome bonus, there are all other kinds of one-off bonuses and promos available, just check the promotions page at House of Jack any time for further details of all current offers, or sign up now to claim up to $450 free.